By the time SP got home from work, we had finished the bottle of wine, so it was time for mixed drinks!!! 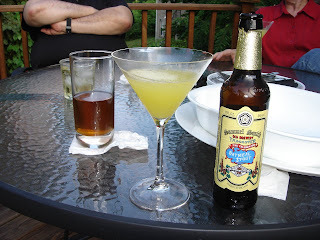 The dads had drinks like gin & tonic and whiskey & soda, but mom & I like a martini that SP makes. We just call it 'The Orange Thing.' He uses freshly squeezed orange juice, triple sec, peach schnapps, and vodka - I am not sure of the exact proportions - and it is quite tasty. SP had a beer while enjoying the bit of sushi and dip that we saved for him! 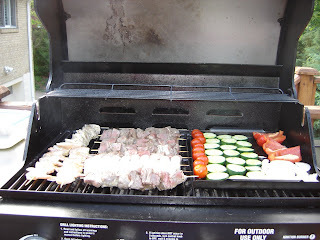 Then it was time for grilling the kebabs. 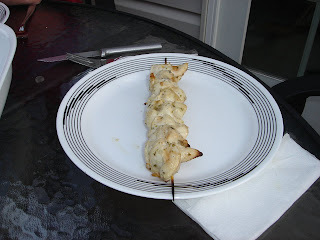 Growing up, we would sometimes have grilled kebabs and I always really liked the marinade we used. It's a simple blend of lemon juice, olive oil, vinegar, oregano, onion, and garlic (though we omit the garlic because of my stomach). 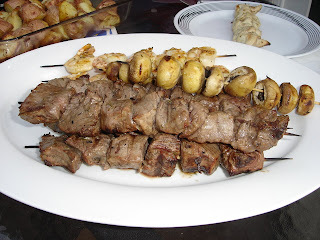 Last night, we had skewers of beef (my request), chicken (since SP doesn't eat beef), and shrimp. 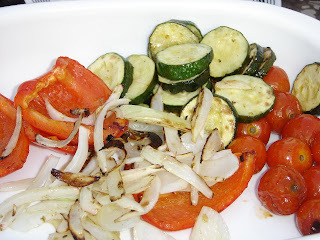 Plus, we had skewers of mushrooms and our grill tray was filled with zucchini (from the CSA), onion, red pepper, and cherry tomatoes. 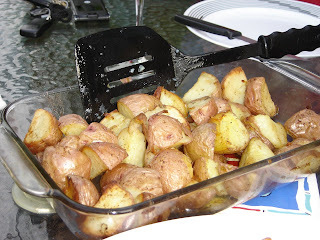 We also roasted some red potatoes inside in the oven (the grill was too crowded!). Oh what a delicious meal - I ate way too much!